Junk in my trunk – Pamela Wood. One thing I surely did not learn in journalism school was the absolute need for sunscreen. I learned my lesson the hard way, when I had to cover a plane crash and was out baking in the sun for eight hours. Needless to say, I looked like a lobster after that. Now I carry sunscreen and a whole bunch of other stuff in my car. You never know what the day is going to bring when you’re a reporter, so it’s best to be prepared. One day, I can be at a press conference with the head of the EPA, and the next I could be at fish kill, with thousands of dead fish floating on a creek. There’s a lot of junk in my trunk. But it’s useful! I just cleaned out my car and here’s what I left in the trunk: waterproof chest waders, rubber boots, work boots, sneaker-sandals, snow boots, snow pants, rain slicker, fleece pullover, a washable jacket to wear with normal clothes, shorts, hats and an umbrella. For the hats, I have a ballcap and also a Gilligan-style hat, because the ballcap brim gets in the way when taking photos. 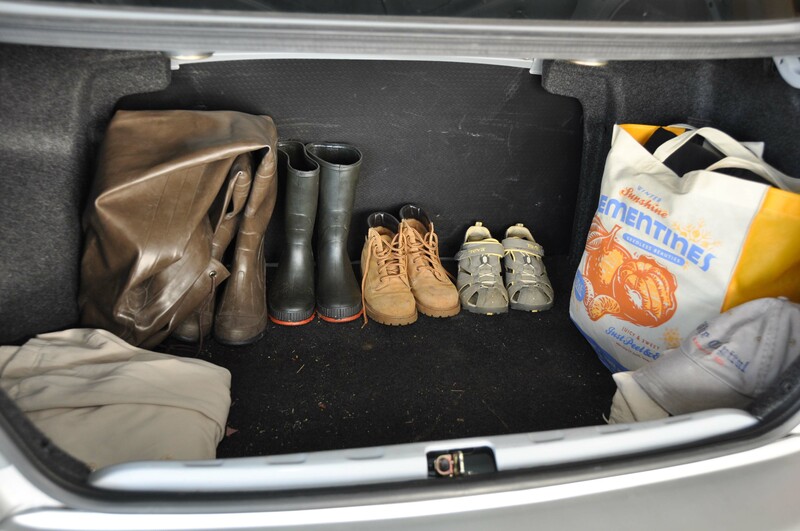 In the winter, my trunk usually also includes a blazer or two. I never know when I might have to help out at the State House, and a jacket is required to sit in the press area on the floor of the Senate and the House of Delegates. Eventually, the snow pants and snow boots will go back in a closet. But they’re staying in there until it is predictably hot every day. 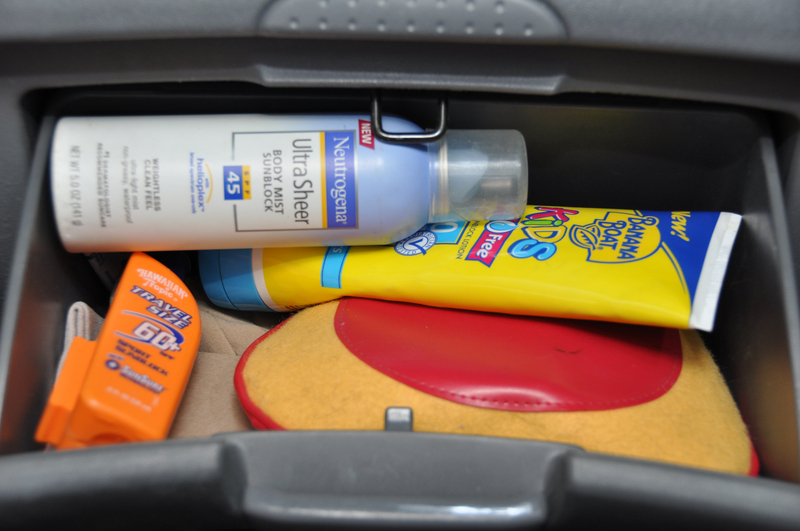 My glovebox, too, is a treasure trove of “just-in-case” stuff: sunscreen, sunscreen, more sunscreen, band aids, socks, hand sanitizer and, inexplicably, a toothbrush. Except for the toothbrush and the socks, I’ve used every single item in my trunk and glovebox in the course of my work as a reporter. For example, just a few weeks ago, I covered a fishing tournament that was organized for “wounded warriors.” I thought I was dressed OK in cargo pants, long sleeve shirt, hat and fleece. You can't ever have too much sunscreen, especially if you're pale and burn easily like me. But the organizers from the fishing club assured me I would be much too cold out on the water and sent me back to my trunk a few times before they felt I was adequately protected. Those guys were right! I wore my snow pants and rain slicker, and I really needed it. Boy, was I glad for the good advice and my well-stocked trunk. We don’t need to snow things so much anymore in SoCal, but some other reporters get fire suits. As the music reporter, I keep extra earplugs and a few bottles of water for post-concert hydration. I want a fire suit!! Hi Pam! One warning, from experience: Be careful of the blazing summer sun, because those tubes of sunscreen can heat up as if you’d microwaved it. Inside that oven of a vehicle they can pop open and splurge goop all over your glovebox. It’s not pretty, especially when it gets all over actual important things one may keep in said glovebox.